Growing up on a farm in South Carolina in the ’60s, the south was still segregated. Even as a young child, he sensed that there was something wrong with this — and his feelings were confirmed after watching the movie To Kill a Mockingbird. The film told the story of a small town lawyer by the name of Atticus Finch who defends a black man against a false criminal charge. Atticus stands up to racism and defends the rule of law at great personal and professional sacrifice. While Atticus was a man of great nobility, he was still only a movie character. Fortunately, Mac had a role model in real life who treated every person with dignity and respect. His father served in the U.S. Army where he met a Japanese woman who worked for the U.S. Army in Tokyo. The two married and had four children. My vow is to stay true to my principles and values by always putting my client and the rule of law first — just like Atticus Finch. With their support, Mac set out to become an attorney and really enjoyed law school. He found he had a knack for always being prepared in class, vigorously defend his position, and fiercely advocating his case — skills that would prove to come in handy in the courtroom. 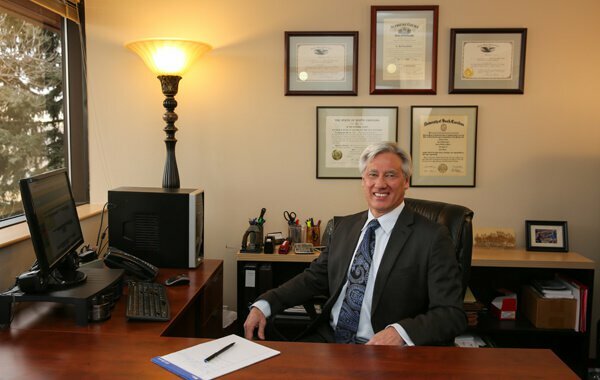 After graduating from law school, Mac continued to hone his skills practicing law for a small firm. In 1989, Mac moved to Colorado and later made Fort Collins his home in 1991. After settling into Fort Collins and starting a family, Mac worked for an insurance defense law firm and spent over three years gaining valuable insight into the defense side. Since then, he has worked strictly for plaintiffs in personal injury litigation — including the largest plaintiff’s injury law firm in Colorado — before setting out to start his own practice, Mac Hester Law. A believer in continuing professional development, Mac is a member of several organizations and actively writes articles for CTLA’s Trial Talk magazine and Auto Litigation Handbook. He also presents at seminars for CTLA and the Colorado Bar Association.